I thought that I’d done really well this week. I thought. I thought I would be able to do my little happy dance and perhaps get myself a congratulatory treat. I thought. As I was cleaning the fridge just before the organic guy arrived I found (lurking in the back) and nice container with a full meal ready to go. A nice grilled steak (1/2), rice and sauteed peppers. Sounds great doesn’t it. In theory. In actuality, it’s two weeks old. Not so enticing now. On to this week and the threat looming of my citrus. How about a really refreshing drink? When we were working out in the field in the summer my Gran would pack us a jar of syrup that we would mix with spring water (the farm has great springs all over it) and eat scores of cookies and rolly pollies when we were “on break”. We called it “Grandma’s stuff”. I don’t know why-we just did. You will love this. Your children will love this. Your children’s children will love this. Trust me. 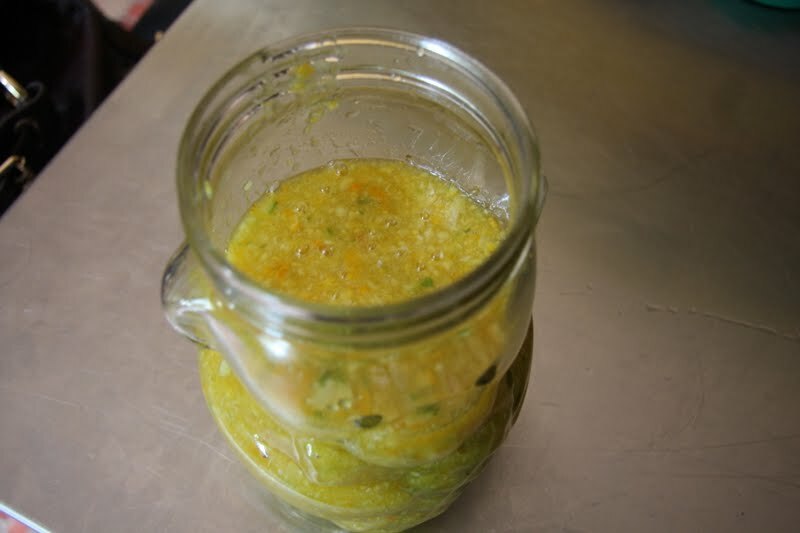 This is a great way for me to use up some of my citrus that has a habit of crawling into the back of my fridge and dying the true death (yeah, I’ve been watching “True Blood” a lot lately). 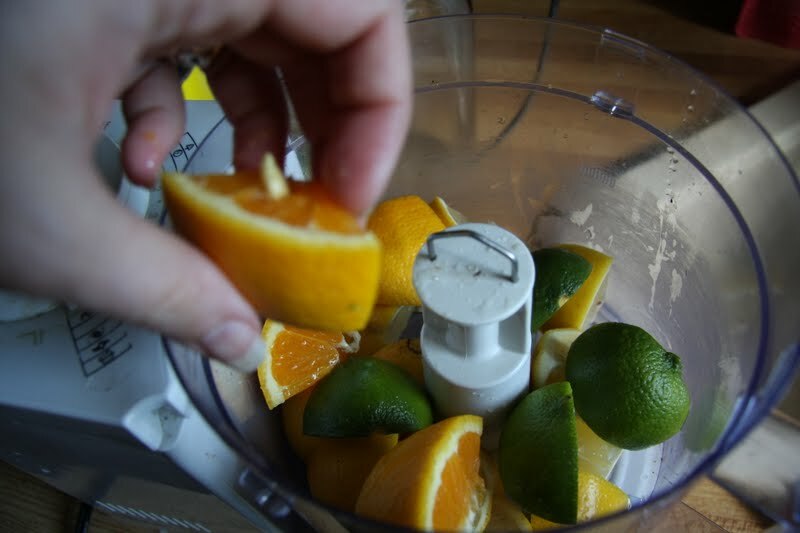 Take three oranges, two lemons and two limes and chop into big chunks for the food processor. Grandma used a crank food mill but I don’t have one so this works pretty nicely. You’ll have about five cups of fruit in here. 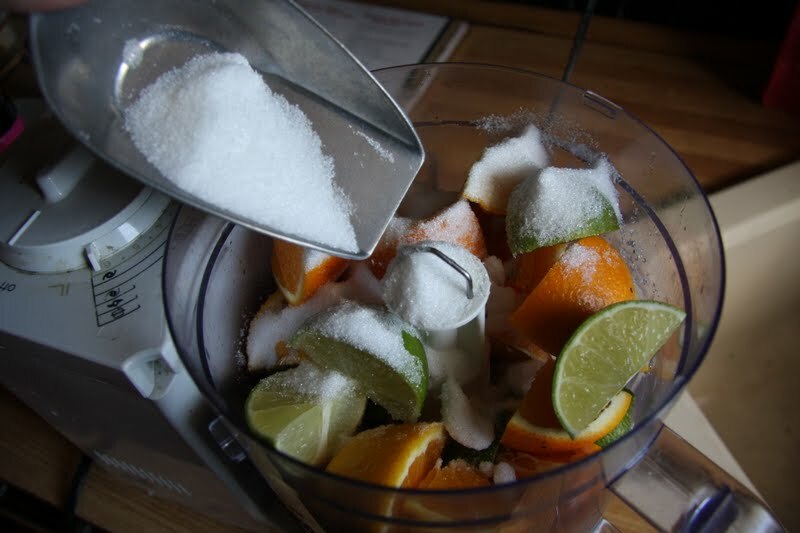 Add an equal amount of sugar and blitz until you only have really tiny chunks. Boil very briefly (five minutes) to creat a syrup and strain into a jar for the fridge. When you’re ready for you wonderful drink take a 1/4 cup of this concoction and put it in a glass and top with cold water and ice. Yummmm…. This looks like a fantastic idea – on our way to the eyeball surgeon today, Mr & I were talking about things we could put in our Christmas baskets this year that are unusual and don't involve quite the time commitment that bread or jam does, and this can be one of those things! How long do you think this would last in the fridge? This would be terrific! Sort of like sunshine in a bottle. I would guess that it would last at the very least a month in the fridge. The syrup component will make it pretty bullet proof. Thanks for the recipe. Sounds delicious. Thanks for visiting, and following. Following you back. So glad you came by. You have the lovliest blog. Hey mrs., what about spiced nuts for your basket? I have a good recipe OR cocoa nuts?